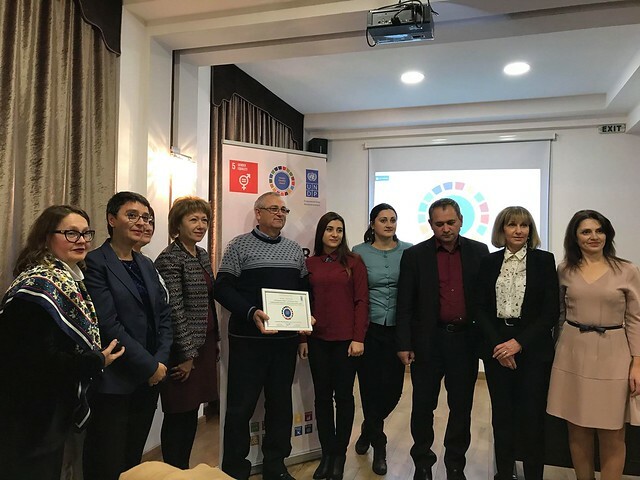 Eight public institutions from the Republic Moldova received a Diploma from UNDP, as a recognition of their determination and performance to deliver transformational gender equality results. This pilot initiative comes to support the effective implementation of the National Strategy on Ensuring Equality between Women and Men (2017-2021), developed with the United Nations System’s support. The awarded public entities are: local governments from Ocolina (Soroca district), Glodeni, Serpeni (Anenii Noi district), Siret (Straseni district), Cirnateni (Causeni district), Valea Perjei (Taraclia district), so as the Ministry of Defence and the General Police Inspectorate. "The Gender Equality Seal is a very useful experience for the General Police Inspectorate because it is for the first time when a thorough, detailed and comprehensive gender analysis is conducted within the Police. This practice included training, guidance, analysis and development of team’s capacities involved in promoting and achieving gender equality objectives. At the same time, the evaluation has unlocked solutions to eliminate barriers, inequalities at workplace and create a cooperative, trustworthy and safe work environment," noted Dorin Purice, Secretary of State of the Ministry of Internal Affairs in the field of public order and security, crime fighting and prevention. The institutions participating in the pilot were couched by UNDP for half a year on their pathway to integrate gender considerations into their policy making and service delivery, human resource management system, communication and daily operations. They were encouraged to promote a gender-equality culture and to improve work-life balance, especially for working parents. The eight pilot public institutions have then performed a self-assessment to understand, where they are against the suggested benchmarks. Based on the assessment, they developed and implemented Improvement Plans that helped to raise to new standards in gender equality. Their work was evaluated against 23 indicators on: Gender-responsive management; Capacities to meet gender equality goals; Enabling Environment in the workplace; Gender sensitivity of Laws, Policies, Plans and Programmes; Partnerships and engagement to meet gender equality goals; and Results and Impact of their work towards gender equality. “I would like to acknowledge with deep appreciation the strong commitment of the Ministry of Defense, the General Police Inspectorate, and 6 municipalities to pilot the Gender Seal methodology and spearhead an experimentation, which we hope will be scaled up swiftly across all public institutions at national, regional and local level,” noted Dafina Gercheva, UN Resident Coordinator and UNDP Resident Representative in the Republic of Moldova, present at the awarded ceremony. The event was attended by about 50 representatives of the central and local public institutions, development partners and civil society. The next step will be to scale up the assessment tool at the national level. In 2017, UNDP Moldova was awarded by its Headquarters with the Golden Gender Equality Seal, for substantial contribution to national gender equality goals. Moldova Country Office actively worked with national authorities and development partners for the adoption of the Gender Quota legislation in April 2016 which sets a mandatory 40% gender quota on party lists for parliamentary and local Elections, a 40% gender quota in the Cabinet of Ministers, and historically allots 14-days paternity leave paid from the state budget. Also, UNDP Moldova contributed to critical amendments to the legislation addressing gender-based and domestic violence, adopted in July 2016, that have introduced a 10-day restraining order that isolates the perpetrators from the family home, along with other unprecedented measures to increase the safety of victims. At the same time, UNDP Moldova provided critical support to women in leadership positions at all levels enabling them to become effective drivers of gender equality agenda at all levels, created jobs and supported women-led businesses, and set up services in support of the most vulnerable and marginalized women across the country.